The AKA Pygmies of the Western Congo Basin are deemed to be a UNESCO Masterpiece of the Oral and Intangible Heritage of Humanity and are known for their complex polyphonic music. 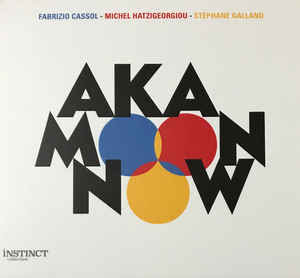 Some 25 years ago the Belgian trio of saxophonist Fabrizio Cassol, bassist Michel Hatzigeorgiou and drummer Stéphane Galland paid a visit to them and immersed themselves in the rhythms they heard there. Since that initial meeting in 1992, AKA Moon has become one of the best known European improvising bands and has explored many African, Indian, Maghrebi, Cuban, Arab, African-American & European cultures frequently collaborating and recording with musicians from those cultures. This new CD is typical of the style they have perfected. The sound is very much their own, although there are clear echos of Steve Coleman's M-Base movement, and also of other European improvising groups. It's rhythmically complex, full of inventive and often ferocious improvisation. The collective interplay has patterns and rhythms constantly shifting between the different instruments. The CD opens with the title track and sets the tone from the start. A deceptively simple melody, not much more than a phrase on the sax over a restless bass and drum rhythm. That phrase is then built up, altered and improvised around, picked up by the bass, hinted at by the drums, before they all finish it off. It can be delicate too. Old and New Dreams, for example, starts with a melodic solo bass, gradually adds some delicate cymbals, and the saxophone comes in to partner the bass before the bass takes over again.